Yes Colonial Williamsburg, Virginia is historic and amazing, but I'm talking about a Williamsburg that's much closer for my New York readers...Williamsburg, Brooklyn! For a change of pace from walking around the city, my family and I decided to head over to Williamsburg, Brooklyn for the day over the weekend and I was impressed by what a hip and trendy little spot this area is becoming. Yes, it's a far cry from your Soho or West Village shops and restaurants, but let me tell you Jet Setters...this place is worth checking out. Right over the Williamsburg Bridge from the Lower East Side of Manhattan, Williamsburg is next to Greenpoint, Bed-Stuy and Bushwick. You can get there by car or by either the L, J, M, Z, or G train. 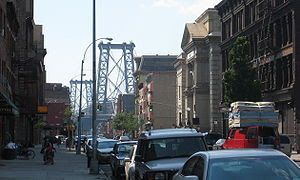 Along Driggs & Bedford Avenues and Grand Street you will find a lot of cute trendy boutiques and some great restaurants. Now, don't expect to head over there and the place will look like a mini Park Slope...far from it; there are many blocks that have just one boutique, or one hip eatery, and some blocks that just have some small walk-ups and some run-down buildings. 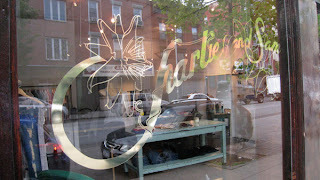 My sisters and I found a great store on Grand Street called Charlie and Sam. It's an awesome boutique that has women's clothing, jewelry, scarves, accessories, shoes (even clothing for the men too!) from Italy, England, France and Austrailia...plus it's dog friendly! After all the store is named after the owner's dogs (Charlie & Sam) who hang out there all day! How cute is that? I picked up a great pair of black suede sandals and a funky pink scarf. From there we re-fueled with a great lunch at Fratelli Brick Oven Pizza. Also, located on Grand Street, this unassuming pizza shop has incredible pies (we had a Margherita and a Sausage & Pepperoni), a terrific house salad with one of the best balsamic vinagrette dressings I've ever had and Rigatoni Bolognese- so good that you'll want second helpings! :-) It's BYOB so we grabbed a couple of bottles of wine from a store on the corner and had a great meal. There are so many other wonderful and well established restaurants like Peter Luger's Steakhouse and the Brooklyn Brewery. For shopping, Buffalo Exchange is a thrift store where you can find some great stuff, Jumelle and Noisette are some other great boutiques, and so much more that I haven't mentioned here. All I can say is that I will definitely be back to this great up and coming neighborhood, and that if you head over too you will quickly find out why I say You Will Love Williamsburg. Wow! That is amazing. Thank you so much for the write up. Come back anytime!